Recognizing the importance of maintaining our monster pike we instantly instituted a catch and release policy from day one of our operation so that we might share these beautiful TROPHY PIKE with you! Catch and release fishing is not just a marketing gimmick to us or something that was initiated recently out of necessity to save the fishery but rather it's a way of life for us. Our catch and release policy has allowed us to have 100% control of our trophy pike fishery. Of course we do allow you to keep walleyes for shore lunch however all pike must be handled properly and returned to the water unharmed. If you are guided, our guides will make sure the fish are handled and released properly. 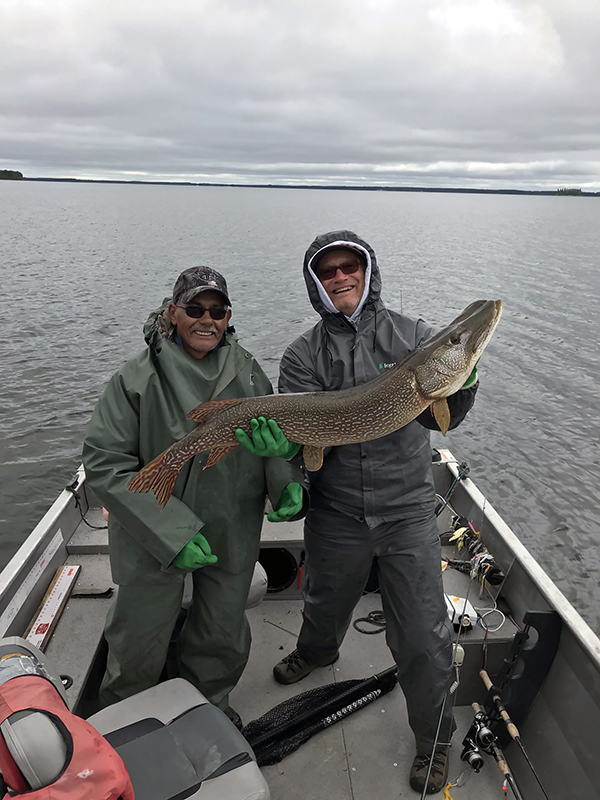 On outpost camp trips, please practice the following fish handling procedures: Michael Owen (below) caught and released this massive 44 inch Northern Pike in early July 2018. With wet hands, lift the gill cover on one side slightly and gently slide your finger tips back towards the gill cover away from the gills themselves. Then slide your fingers in a curled position towards the snout. Now you can hold the fish easily, without the chance of getting cut from the gills. To help the fish revive, place the pike gently into the water and assist by holding the pike upright with one hand and tapping the pike gently just behind the head with the edge of your other hand just enough so that you can see the rear part of the gills flex open slightly as you tap every two or three seconds. You can take brief breaks from this proven procedure but continue to hold the fish in an upright position until you feel the pike can swim off on its own. Another technique, although probably not quite as effective, is to move the fish back and forth in the water. However, we feel that if you must move the fish we prefer that you move side to side vs. back and forth. Never let the fish go until you see the gills flex open and you feel the muscles in the pike's tail begin to flex. Then and only then release the fish and watch to make sure it swims down and does not "belly up" in the water. If the pike does "belly up" go and retrieve it again and repeat the release techniques. We understand that even when all of these measures are used that a small percentage of fish will still die. We ask that you do your best to help us be great stewards of these trophy pike. After all, we love our huge pike and we want to share them for years to come with you, our valued guests.